Nanopore sequencing is being applied to fields where portability, ease of set up, long reads and real-time analysis make a difference and where users want to control the time-to-results. The technology is proven with a variety of input material such as genomic DNA, amplified DNA, cDNA and RNA. Learn more: what are the applications of nanopore sequencing? Nanopore sequencing data starts to stream immediately, rather than being delivered in bulk at the end of a 'run'. How does real-time analysis happen? The size of a confectionary bar and USB-powered, the MinION may be used outside the traditional lab environment – taking the analysis to the sample. VolTRAX, in development for automated sample prep, will further enable sequencing in diverse environments and by those with fewer lab skills. Library prep can be completed in under 10 minutes. How has MinION been used outside the laboratory? Nanopore sensors are based on electronics and can be scaled to any size device, to be used in any environment. The MinION is a portable sequencer; flow cells contain up to 512 nanopore sensors. 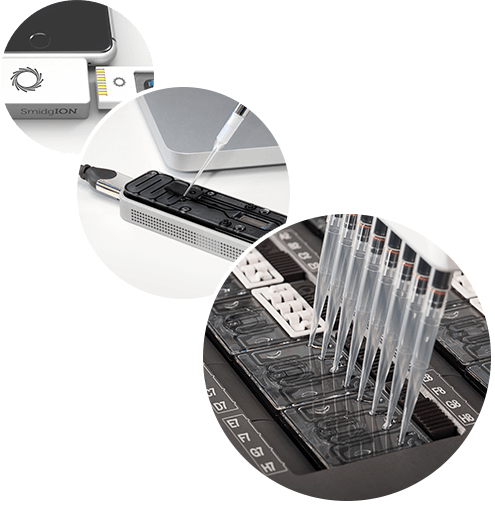 GridION offers integrated computing with up to 5 MinION Flow Cells. PromethION is designed to use up to 48 flow cells, each with up to 3,000 nanopore sensors. 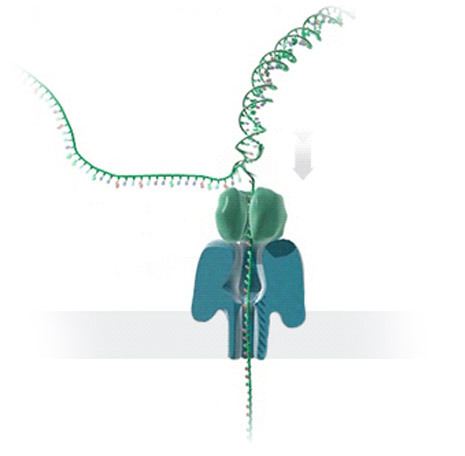 Many parameters can be adjusted or scaled, including the time for which the experiment is run, or the speed at which the DNA passes through the nanopore. The Oxford Nanopore system processes the reads that are presented to it rather than generating read lengths. Sample-prep dependent, the longest read reported by a MinION user to date is >1 Mb. Long reads confer many advantages, including simpler assembly and in the analysis of repetitive regions, phasing or CNVs. Nanopore sensing is a direct electronic analysis of the target molecule – native analysis – with no surrogate markers. Sequencing native DNA (and RNA) avoids bias introduced by amplification steps, opening up opportunities for epigenetics. Workflows are kept simple by avoiding amplification or light-based measurement steps.